• Recognizing depression in brain-damaged patients poses considerable problems. The standard dignostic criteria often are not applicable since the neurological lesion may distort or even obliterate salient features of depression. Patients actually may deny being depressed or dysphoric, not have a depressive affect, or be totally unaware of abnormal vegetative behaviors. Furthermore, brain lesions themselves may produce striking behavioral alterations that can be mistakenly attributed to depression, or striking behavioral changes due to depression may be mistakenly attributed to the brain lesion. 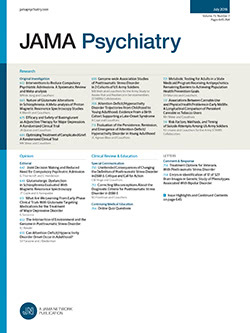 Based on five case studies, several clinical guidelines for recognizing and diagnosing depression in brain-damaged patients are offered. These cases also provide a data base to generate initial hypotheses about the neuroanatomical basis of the depressive syndrome. By observing how focal brain lesions modify the signs and symptoms of depression, inferences are made about brain areas crucial for modulating the various features of the depressive syndrome.